Bree, a nerdy ambitious freshman, can’t wait to start college. Shunned in high school for her single-minded devotion to her studies, she looks forward to a place where brains trump social status. In her first week, she adjusts to college life but finds it hard to get along with her peers. After a fight with her roommate, she moves into an old house, only to find that it is haunted by the ghosts of five cute guys. > Preview the entire book. > View the trailer here. Polterguys Vol. 1 Special Features and Extras is a compilation of illustrations, articles and photos related to the publishing cycle of Volume One of the Polterguys series. 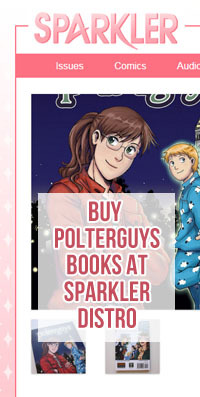 It also features an original Polterguys short comic. Bree is finally getting along with the ghosts when Clive comes back to collect another one of them — right before midterm week! As she investigates Ben and Alex’s past, Bree’s life gets even more complicated when an old friend from high school reappears in her life. Meanwhile, the ghosts stumble onto Peter’s secret and have some pretty tough decisions to make. Can the undead really be friends with the living? Brigid Alverson on Robot6 – What are you Reading? Megan Lavey-Heaton on Robot6 – What are you Reading? 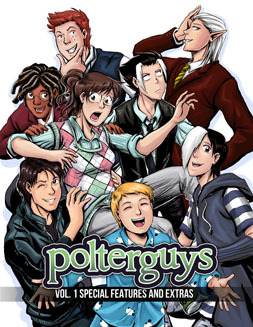 Interested in writing about Polterguys? Download a hi-res copy of the cover, photos of the book and other related images from the blogger’s kit. 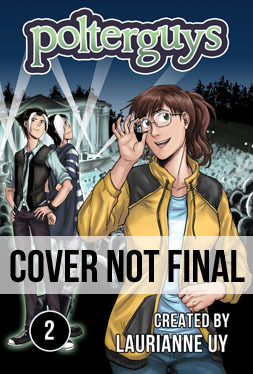 Laur creates comics and blogs about drawing manga, self-publishing and creativity. For her Berkeley art history thesis, she got away with analyzing works by CLAMP, her favorite Japanese comic artists. Nathan studied screenwriting at USC. He was a PEN Center USA Emerging Voices Fellow 2012 and is pursuing his MFA at the University of Michigan. Follow me on Twitter, Facebook or Tumblr for updates and more info about my projects. You can also subscribe to my blog’s RSS or and sign-up for my newsletter to get free art, tips on creativity and self-publishing. Questions? Contact me at laurie.uy [at] gmail [dot] com. 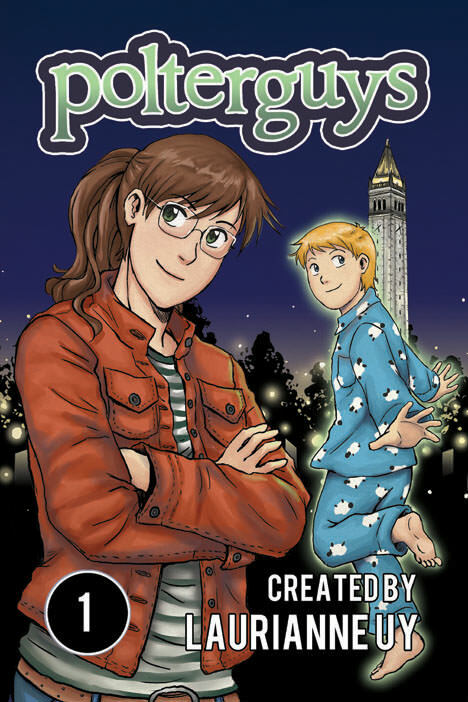 is now serializing at Polterguys.laurbits.com! "One of the most unabashedly fun new comics I've read this summer." "Delightfully charming...A great spin on the typical harem-style of manga story-telling.